In November of 2007, the Expo Construction Authority and Culver City agreed that instead of building a “temporary” station at the terminus of Phase I of the Expo Project, that the Authority would build the permanent aerial station in time for the grand opening of Phase I. As part of that agreement, Culver City agreed to pay the Authority $7 million to cover some of the construction costs. The deal seemed a classic win-win for everyone. Culver City moved forward not just with the most ambitious “Transit Oriented Development” project slated for the line, but also on a public health grant to connect the station to the Downtown through a safe and attractive pedestrian walkway. For once, everything was going smoothly. Until last week’s Expo Construction Authority Board Meeting. 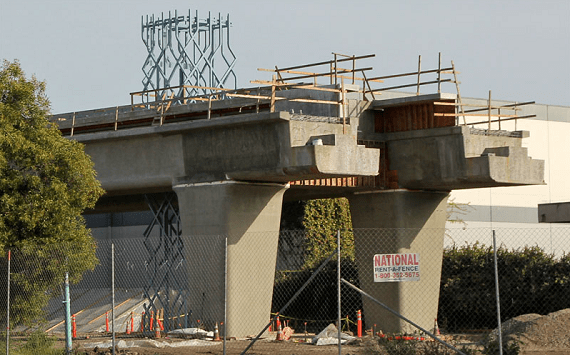 Culver City officials are withholding payment of $7 million, $4 million of which is for station construction, they promised the Authority in large parts because the city feels the station that is being constructed is not the one they were promised in the M.O.U. The Construction Authority doesn’t dispute that plans for the station have changed and have been somewhat downsized, but that they didn’t promise a certain station to Culver City in the M.O.U., just that they promised an aerial station for Phase I. At the meeting, much of the confrontation was between Supervisor Zev Yaroslavsky and Culver City staff. “We agreed to build a station in Phase I, you agreed to pay $4 million.” Yaroslavsky lectured the staff. “The State puts up $50 million, you put up $4 million and we build a station in Phase I.” Expo Authority Lawyers backed Yaroslavsky’s claims, while Culver City Attorneys stated the opposite. So here’s where we stand. Expo is now refusing to build anything in Culver City other than a bare-bones minimal light-rail station — no bike path, no National Boulevard improvements, no facilities around the station. Culver City won’t pay anything to Expo unless the Expo Board passes a motion to build the station as Culver City wants. Expo says they won’t build anything in Culver City until the City pays what they promised. Culver City says they will pay the money once they get what they want, but Expo is asking for an escrow. CulverCity won’t do an escrow unless Expo builds what they want. I’m trying to find a draft of the M.O.U., which is quite a bit harder than looking through old agendas. Once I have it, we’ll post an update here. In the meantime, you can listen to part of the showdown between the Expo Board and Culver City staff thanks to audio recorded by Gökhan Esirgen who alerted me to this story in the first place. Well, what the heck does Culver City want? I think much of this is just grandstanding by Culver City. They are tight on money so they are looking for some excuse, any excuse to delay payment. It’s a sign of the state of the Expo line that today Culver City station looks just like your photo from March. Open! Open! Open! How can something delay the opening now that it’s mostly done, and only six months away from opening? Whatever happens the station should open when they said it would between December 2011, and march 2012. Everything else can be worked out later. Unbelievable!!! The issue seems very straight-forward and begs for compromise. Most likely, Expo, made substantive station design fulfillment changes for cost-reduction purposes (was this similar to how the MSE was substituted for a piered-rail between La Cienega and Ballona Creek? ), without keeping Culver City in the loop. When Culver City learned of those changes (late), they digested them and blew a gasket. Then Culver City points fingers at Expo (“Shame on you!”). Expo, defensively points back to the “agreement.” Sounds like Expo may have blown it in 2 areas: project communication and change management. If this is the case, (1) at the least, Culver City would be due an apology and some (but not all, due to cost issues) retrenchment by Expo, to show good faith and reaffirm the partnership with Culver City. …And (2), Expo needs to see some “good faith” coming from Culver, in terms of willingness to work with the Expo team to reach a “middle ground,” rather than sending it to the legal team and working up a law suit. Legal recourse is the least desirable outcome for both sides and if that’s the card being played, it’s most unfortunate and shows little wisdom on the part of both Expo and Culver City. I’m hoping that this “spat” will run it’s course quickly and the parties will resolve their suspected, honest differences in the interest of all the people who live anywhere near Robertson and Venice. Go with the bare-bones minimal light-rail station and move on…. Can’t people in Culver City read blueprints? This is like deciding to change your flight when your plane is thundering down the runway. You could’ve looked earlier. Great way to rush public works projects during a recession, meshuganas!! Breaking: In Split Decision, California Supreme Court Gives Expo the O.K.